Most of the time I spend in Sonoma is in my tattoo studio creating illustrations or bent over scribbling on someone's body. While I am leaving permanent tattoo marks on people, Sonoma has marked me in a number of ways, and after a dozen years living here, I think I'm qualified to give the inside story on secret, super-secret and out-in-the-open-secret local places worth knowing. Sure, there are lots of food places out in the open in Sonoma. And true, there are breakfast joints where you can pay more than $20 for two eggs with one slice of bacon and one small, sad potato while surrounded by a décor of corporate logos. But here is the skinny on a small-town, family-owned, warm-hearted place in an art deco–style building built in 1934 that once held a brothel (though I'm not sure if it was Juanita's), which for the past 20 years has been the Creekside Cafe. The owner, Casey Monahan (son of Mike and Jody Monahan), shows a real work ethic and commitment to the community, at least when it comes to serving an epic selection of affordable eats. The menu has homemade breakfast and lunch selections, and the restaurant itself offers a chance to rest where locals eat. Two eggs straight-up will set you back $6.75, while the chicken-fried steak, the homemade corned beef hash and eggs, and the pork chop, are all served with eggs and all come in at under $10. You want to go "upscale"? The New York steak and eggs comes in at $12.95. Well, it's lunchtime. Already? Yes. And nearby on out-of-the-way Arnold Drive, you'll find Picazo's. The Picazo and Chavez family-run business carries a unicorn logo. Indeed, offering affordable food like what's served at Picazo's, in any tourist town—well, it's as rare as that mythical creature. Picazo's can be counted on to win any local vote on who serves the best burger in Sonoma, and the burgers come in all shapes and sizes. Beyond the burgers, Picazo's offers a variety of American and Mexican items, from breakfast to dinner, and with a full wine and beer menu that's prepared with love and served in an almost New Jersey–style rustic diner joint. I can also assure you that the Latino hospitality will leave you with change in your pocket after leaving this place with a full belly. Mayo su estómago ser lleno, y su corazón ser contenido! Meanwhile in plain sight, famous and well-traveled Sonoma Plaza holds more bottles of wine than John Steinbeck's Cannery Row winos. Even on the popular and well-traveled Plaza, there are the occasional secrets. While most creative and craftspeople were driven off Sonoma Plaza by economic realities—i.e., the rent is too high—there are some too tenacious to move. They are still putting time in to create art that you can wear collect—and eat. Park your car and pop into Large Leather, owned by Jessica Zoutendijk. She is formerly of Amsterdam's Waterlooplein handcrafting district and now she's a Sonoma fixture. In her narrow space, the smallest on the Plaza, you could imagine she is spinning full cowhides like pizzas. The fact that she is a petite woman of enormous skills and generosity of spirit only becomes apparent when you step in and get a view and a whiff of all that leather, and scan the full racks. Jessica is creating beautiful hand-wrought and magical modern-leather crafts. She handles large cow skins like a boss, adding credence to the old canard that great things come in small packages. Hungry again? I am. It's time to go find Mike Zakowski, aka Mike the Baker, who participated in the Coup du Monde de la Boulangerie competition—World Cup of Baking—in France a couple years ago as a member of the U.S. Baking Team. He helped earn the team a silver medal. Mike specializes in baking with ancient grains that he grows himself. His favorite grain, einkorn, is said to be easily digested, and I can attest to that. Mike's a regular presence at the Tuesday night farmers market on the plaza during the summer, and the Friday morning farmers market. He's often spotted looking like the famous image by Henri Cartier-Bresson—a man with baguettes on a bicycle (or on his electric bicycle), bread piled in side baskets as the rider makes local house deliveries or pulls his portable wood-fired oven behind an antique truck. 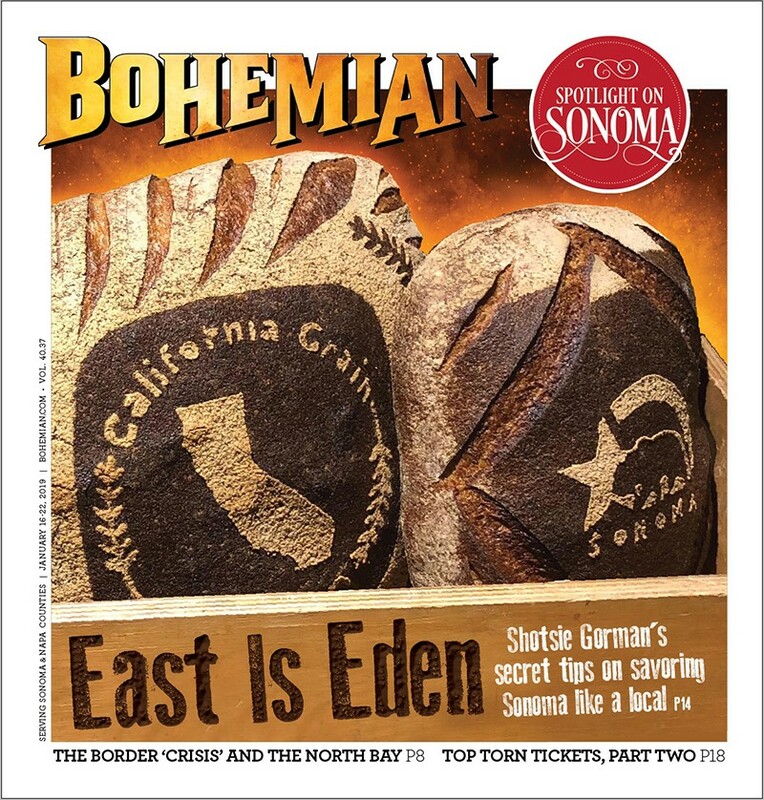 Mike's range and dedication and obsession transform bread into art; his loaves grace the cover of the Bohemian this week. OK, time for more shopping. Check out the Lonesome Cowboy Ranch, which features Native American art (old pawn jewelry, pottery, kachinas, etc. ), hand-loomed rugs and antiques. There are also custom cowboy hats and a huge selection of vintage cowboy boots—hundreds of them—along with a large selection of Hawaiian shirts and leather bomber jackets. Owner Sandi Miller keeps the store packed with product while manager Bob Barnhart keeps things moving with a no-pressure sales stance. The Lonesome Cowboy is a standout on the Sonoma Highway.